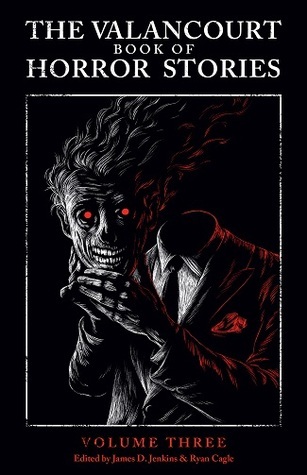 THE VALANCOURT BOOK OF HORROR STORIES: Volume Three, edited by James D. Jenkins and Ryan Cagle, shows that you can have a "series" of collections that just keeps getting better and better! Honestly, I didn't come across a single story in this collection that didn't feel like it deserved to be included. I have no idea how they can keep finding these "hidden gems", but as long as they do, I'll be purchasing. The stories varied in theme and time period, as with the previous two books in this series. THE VALANCOURT BOOK OF HORROR STORIES: Volume Three, edited by James D. Jenkins and Ryan Cagle, shows that you can have a "series" of collections that just keeps getting better and better! Honestly, I didn't come across a single story in this collection that didn't feel like it deserved to be included. I have no idea how they can keep finding these "hidden gems", but as long as they do, I'll be purchasing. The stories varied in theme and time period, as with the previous two books in this series. Personally, I feel this makes for wonderful reading, as the variety is constantly engaging the reader, and you don't know quite what to expect from one tale to the next. Overall, if you haven't read this volume--or its two predecessors--I'd remedy that immediately. Another fantastic inclusion to the Valancourt Press books! Highest Recommendation! There aren’t enough superlatives for these collections. There isn’t a bad story in the bunch, and it’s refreshing to read an anthology that doesn’t contain even a single story that I’ve already read. Looking forward to Volume Four! Absolutely first rate. The Purdy and Westall tales are particularly well-chosen. It is such a pleasure after 40 years of reading horror to open an anthology and find that all the stories are new to me. Perfect compliment to the season. An excellent variety of the old, new, gothic, horrifying and humorous. You can pretty much take Valancourt's impeccable taste to the bank with every release, and their legendary standards continue here. Highly recommended not only for October but for any time of the year. The same ultra-high quality publication we've come to expect and appreciate from Valancourt Books. My second favorite in the VBoHS series after Volume One. Didn't care for two stories (Mr Evening and “With What Measure Ye Mete . . .”), but it's less about the quality of the writing and more about my personal taste.